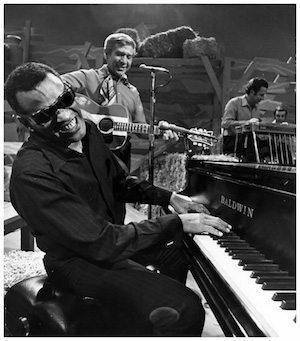 Ray Charles isn’t known as ‘The Genius’ for nothing. 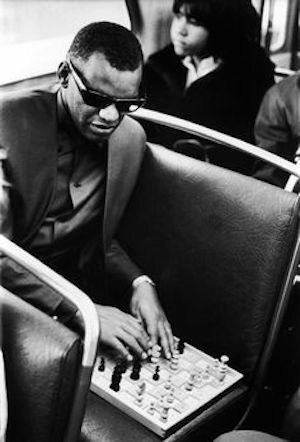 Born Ray Charles Robinson is Albany, Georgia at the height of the US depression in 1930, he was blind from age seven but that didn’t hamper his musical development and he is recognised as the most significant pioneer in enabling R&B (Rhythm and Blues old school), gospel and blues to mutate into early soul forms. As such he is as influential as any popular musician from any era and is cited as such by everyone from The Beatles and Van Morrison to Elvis Presley, Aretha Franklin and particularly Stevie Wonder. All would cover his material either on record or on stage. Or both. 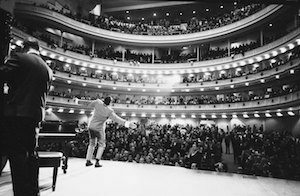 A sonic marvel, Charles’ abilities as a pianist were matched to a vocal power that shaped the development of rock’n’roll in his formidable wake. 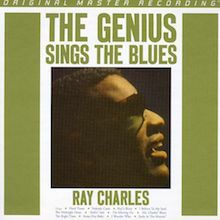 Tracks like “Georgia On My Mind” and “Mess Around” are but two pinnacles in a style that has influenced Willie Nelson and Otis Redding while Frank Sinatra, who wasn’t known for placing others on a pedestal above him, noted, “Ray is the only true genius in show business.” Accolades aside his album releases sing for themselves. His early Atlantic discs are perfect examples of black music pre-crossover while the ABC Records on which we major produced his real breakthrough from the chitlin’ circuit, so-called, to mainstream acceptance and superstardom. Rolling Stone magazine voted him the second greatest singer of all time (after Presley) and placed him in their top ten most important greatest artists of all time. A hard man to pin down, Charles was a maestro in various genres, barrelhouse piano, country blues and stride all flowed from his fingertips and his songs have always given maximum pleasure. This is a great time to rediscover him, especially for the generations who weren’t enthralled by him at first hand. His legacy provides a link between the Jazz Age and artists like Nat King Cole and Louis Jordan, Art Tatum and Louis Armstrong through to James Brown. His importance cannot be underestimated but it’s his music that captivates across the years. 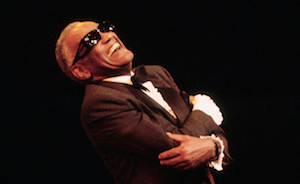 The son of Southern sharecroppers, Ray Charles Robinson was raised in Georgia and Florida. 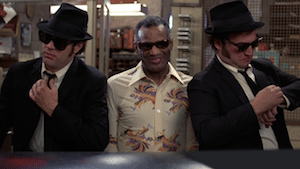 He learned to play boogie-woogie at a young age, despite being beset by glaucoma and blindness. At school he played classical piano, specialising in Bach, Mozart and Beethoven and read music via braille, reading left-hand while his right hand held down the chords. 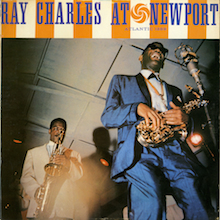 Despite his formal talents young Ray was way more into jazz and blues records and built a reputation as a performer when he was a teenager. 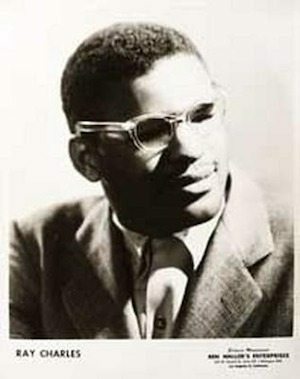 His early friends included Charles Blackwell and Quincy Jones and Ray enjoyed his first national hit aged 19 with “Confession Blues” in his group The Rocking Chair. 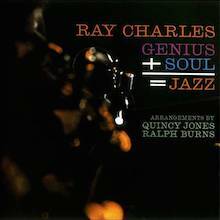 Prodigiously accomplished he was already arranging for Cole Porter (“Ghost of a Chance”) and Dizzy Gillespie (“Emanon”) and was hotly pursued by Atlantic’s Jerry Wexler and Ahmet Ertegun who signed him to the label and then reaped a fantastic reward when Ray sold millions of albums. A turbulent personal life and problems with drugs might have hampered a lesser man but in Charles case pain and experience only enriched his work. His stellar break out came with “What’d I Say”, a single divided into two parts and a revolutionary number that impacted on everything from nascent R&B to the British Blues Boom and the country blues revival of the 1950s and 1960s. Let’s pick him up when The Genius Hits The Road (1960) where he is sympathetically backed by Ralph Burns, David “Fathead” Newman and the rhythm section of Milt Turner and Edgar Willis on bass and drums respectively. This album features “Georgia On My Mind” and splendid examples of his style in “Alabammy Bound”, the immortal “Basin Street Blues” and “Deep in the Heart of Texas”. This disc is virtually a crash course in vintage soul/R&B. It isn’t just recommended it’s mandatory listening. Dedicated to You and the Ray Charles and Betty Carter album (both 1961) find our hero in rampant form. The latter includes a gorgeous version of “Baby, It’s Cold Outside” and a host of evergreen gems like “People Will Say We’re In Love” that find Charles straddling the old and new worlds of blues. 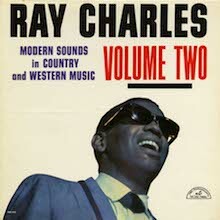 Owing to a complex legal situation Charles found himself contracted to several paymasters in this time but a more generous ABC-Paramount deal gave him artistic control and he repaid that debut in full with the vital Modern Sounds in Country and Western Music (1962), the album is simply a Treasure Island disc. Containing Charles immaculate takes on “Bye Bye Love”, “You Don’t Know Me” and Hank Williams’ classics “You Win Again” and “Hey, Good Lookin’” this album (arranged by Marty Paich) is just glorious. If you’ve never heard it you’re lucky, because discovery is everything. Released originally in Mono and Stereo versions the current technology restores this magnum opus to thrilling clarity. Get it and do yourself a favour. So it goes: the Volume Two is another five star affair including “Take These Chains From My Heart” and “Oh, Lonesome Me” but it’s the chestnut, “You Are My Sunshine” that will establish Ray’s fame worldwide. Thereafter Ingredients In A Recipe For Soul (1963) introduces the generic word to a whole new audience and “You’ll Never walk Alone” and Sleepy John Estes’ “Worried Life Blues” simply rubber stamp Charles status. The standard doesn’t drop. Sweet & Sour Tears (featuring “Cry Me a River”) and Have a Smile with Me are two sides of a coin; one is darkly brooding, the other light and humorous. By now Sinatra’s show business assessment has come to fruition. The Live in Concert disc (1965) is another stand-alone classic and a massive influence on wannabe soul singers everywhere. Van Moirrison, a true disciple, often mentions this work, and if it’s good enough for Van… Recorded at the Shrine Auditorium, Los Angeles in 1964, this is an example of an artist at the height of his powers. Together Again marks one of the last times Ray works with his producer mentor Sid Feller while Crying Time (1966) meets the new hippy movement head on during “Let’s Go Get Stoned” and “You’ve Got A Problem”; both cuts will be a main influence on Donny Hathaway. 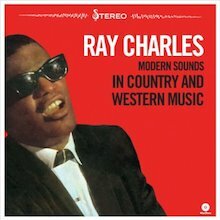 Ray’s Moods and Ray Charles Invites You to Listen return Ray to his roots and are expertly helmed by Joe Adams. 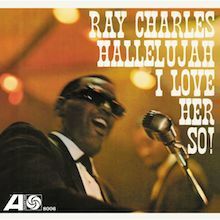 The latter features Ray’s version of The Beatles’ “Yesterday”, a take that Paul McCartney reckons is his favourite. A Portrait of Ray (check out his emphatic interpretation of “Eleanor Rigby”) and I’m All Yours Baby! Are marvelous keyboards and voice excursions and Doing His Thing bookends the end of the decade with flair and humour – particularly on the oft-covered “If It wasn’t For Bad Luck”, a co-write with accomplice Jimmy Lewis. Just for good measure the artwork on all the covers has a delicious period charm. Now able to boss his own imprint, Tangerine, with ABC’s advantageous backing, Ray releases Love Country Style, another must-hear recommendation. Discover him dig into Mickey Newbury’s “Sweet Memories” and “Good Morning Dear” and wonder at his grand version of Jimmy Webb’s “I Keep It Hid”. Volcanic Action of My Soul (1971) mines similar territory with total success – adding folk blues to more Webb (“Wichita Lineman”) and the best take on The Beatles’ “The Long and Winding Road” outside the original. The fact that Buddy Emmons provides pedal steel makes it all the sweeter. Another classic from 1971. Thereafter the albums flood out so we urge you to consider all the above and delve into the best of the anthologies and collections. A Man and His Soul originally released 1967) as a double-album is the perfect introduction to a cross-section of the breakthrough material and any compilation that features “I Can’t Stop Loving You”, “Hit the Road Jack” or “Together Again” has to be explored. In latter years Ray returned to his love of country music, recording with Willie Nelson and George Jones from his peer group as well as newer artists like Hank Williams Jr. and B.J. Thomas. Immortalised on the Hollywood Walk of Fame and in statue form in his hometown of Albany, Georgia, Ray Charles blessed us with his presence right though to 2004 when he sadly passed in his California home. Latterly his contributions to the Civil Rights Movement and The Ray Charles Foundation enabled him to help those who like him emerged from poverty and sought to better their lot. .